INTRODUCTION– Achalasia is an uncommon disease of unknown origin. Management is challenging. Laparoscopic esophageal myotomy is the best treatment option, having variable results. We report the medium-term outcomes on 16 patients after Laparoscopic Heller myotomy and partial fundoplication. 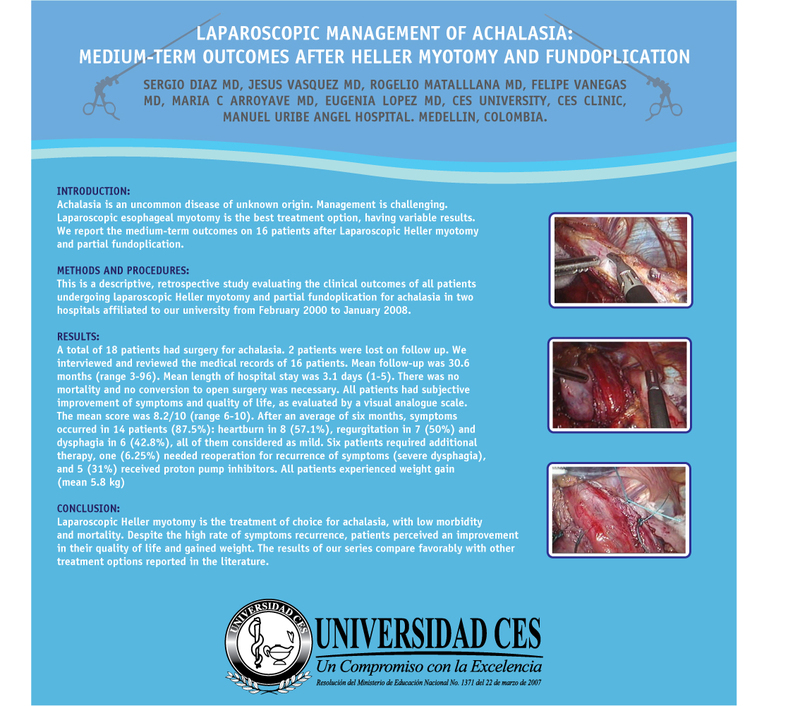 METHODS AND PROCEDURES– This is a descriptive, retrospective study evaluating the clinical outcomes of all patients undergoing laparoscopic Heller myotomy and partial fundoplication for achalasia in two hospitals affiliated to our university from February 2000 to January 2008. CONCLUSION– Laparoscopic Heller myotomy is the treatment of choice for achalasia, with low morbidity and mortality. Despite the high rate of symptoms recurrence, patients perceived an improvement in their quality of life and gained weight. The results of our series compare favorably with other treatment options reported in the literature.